Line the bottom of an 11-inch by 7-inch baking pan with parchment paper or wax paper. To make the first layer, in a small bowl combine 1 cup chocolate chips and 3 tablespoons peanut butter. Microwave for 60 seconds at full power and stir to combine. Microwave a few more seconds if needed, until the chocolate is melted and smooth. Pour chocolate mixture into prepared pan and spread evenly. Place baking pan in the freezer until the layer is hard, about 2 to 3 minutes. Meanwhile, in a medium sized bowl, combine marshmallow fluff, 1/4 cup peanut butter, and powered sugar. Using a wooden spoon or strong spatula, stir until a soft dough ball forms. Remove nougat dough from the bowl and press on top of hardened chocolate layer. Sprinkle peanuts on top of nougat and gently press them down. In a small saucepan over medium heat, combine caramels and heavy cream. Stir constantly until caramels have melted and cream is incorporated. Pour immediately over the peanut layer, and use the back of a spoon to spread evenly. 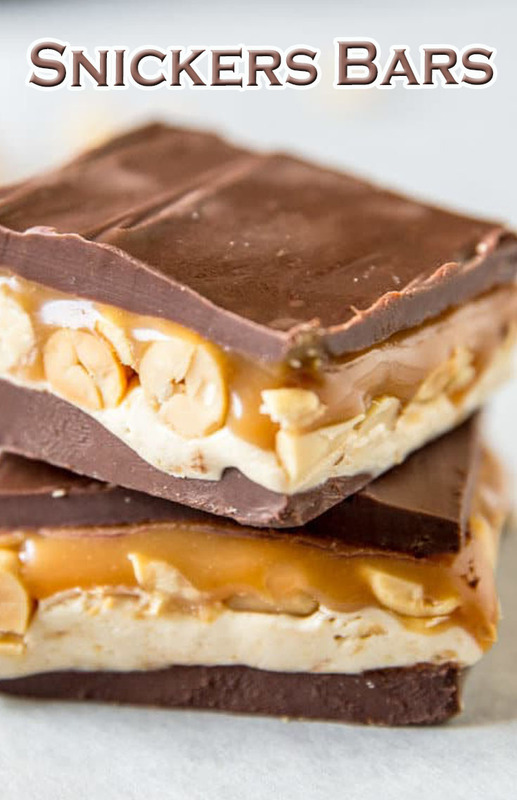 Refrigerate until caramel has set, about 5 minutes. Meanwhile, in a small bowl melt the remaining chocolate and peanut butter by microwaving for 60 seconds, as in step 2. Pour over caramel layer and spread evenly. Place in fridge for 10 minutes, or until chocolate layer has hardened.